Begin by washing the beans over a strainer, making sure to remove any debris or deformed pieces. Place a casserole or Dutch oven on the stove and add the beans. Immerse in water and add the rest of the ingredients. Cover and let simmer for an hour and a half, or until the beans are soft. With a potato masher, slightly mash the mixture to make the broth thicker. Cook for 20 more minutes and serve hot with white rice. You can leave the beans soaking in water the night before. This will help reduce the cooking time. Using a pressure cooker will also speed up the process. If you have access to epazote or wormseed in your local market, use it in place of the oregano for added sabor. Frijoles (beans) are one ingredient never missing from my kitchen. Plus, they’re a great source of protein. Many types of beans exist, but the classic stewed black beans have to be one of my favorite dishes. You can accompany this dish with white rice or eat them as a rica soup, with chard, with chorizo or pork, or even as a main dish. 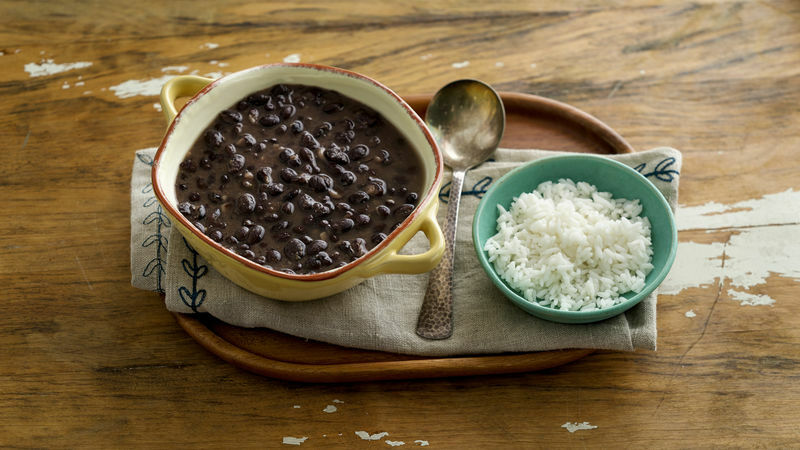 With my special recipe for black beans, you can start making new combinations of your own. Let’s cook!